Plans for redevelopment of a 37 hectare site have been submitted to the Local Authorities and Joint Development Authority EPA-ORSA. The ZAC Seine Gare Vitry has been designed with water and nature at its heart. A thriving mix of uses will be created around blue/green ways and corridors to create a unique and economically vibrant new quarter, overlooking the River Seine. The 37 ha site forms part of the larger 300 ha Ardoines development project, the largest and most significant development operations in France. The masterplan was developed to maintain and encourage the economic sector, whilst allowing for significant development for over 6.5 million sq ft of habitable space (including 4,500 new homes, over 1 million sq ft of offices and a further million sq ft of industry). An integrated planning and design approach was taken to tackle the complex site issues, such as the significant risk from flooding, contamination and land ownership, as well as maintaining existing businesses as the masterplan would be delivered. 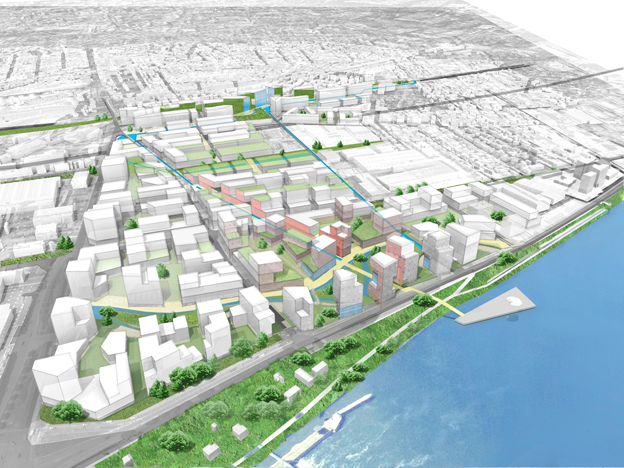 This approach helped to identify solutions that would provide wider benefits and establish a clear strategy for redevelopment that would be safe, resilient and also create a unique sense of place. This was based on the award winning ‘LifE’ (Long-term Initiative for Flood-risk Environments) approach developed by Baca and funded by the UK government department DEFRA. Three new development nodes will provide the “catalysts” for the growth of what is a flexible masterplan. These will be linked by ‘water ways’, such as rills, swales, paths and pools to form a navigation and way finding mechanism, leading inhabitants and visitors alike across the site. This aquatic framework will double as part of a sustainable drainage system, slowing the flow of rainfall and filtering run off before it enters the watercourse. The waterways will converge at the nodes to form aquatic features (rain squares, fountains, mirror ponds, flood parks), bringing the riparian environment to the surface. These blue/green waterways will cascade down to the new river bus terminus within the ‘blue avenue’ that is the legendary Seine. This new “Mise en ‘Seine’” will celebrate the historical and environmental context, whilst creating a safe place to live.